Shopping for the perfect espresso maker can be a nightmare. With so many systems available, it is hard to know which is the right choice. This only gets more concerning when you consider the price of some of your options. The last thing you need is to spend serious cash on a brewing system that doesn’t suit your needs. This article will do the Saeco HD8753/87 review and help you to determine if it is a good fit for you. We might also be using the other name of this machine, that is Saeco Intelia One Touch. It is among the top notch Saeco machines available in the market. You can choose any number of brewing customizations on the Saeco HD 8753/87. 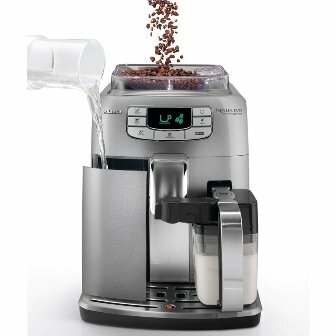 Choose the temperature, volume of water, and even grind setting for your beverage. Also select whether you want the coffee pre-infused with water to add to the flavor and texture of the coffee. Additionally, seven pre-programmed selections allow you to choose which type of coffee you want to brew. Now the perfect latte or cappuccino, tailor made to your preference, is just a single press of a button away! The Saeco HD8753/87 comes equipped with a ceramic burr grinder. Needless to say, the grind quality of a burr grinder puts any blade grinder to shame. This feature ensures that you get quality coffee grounds each and every time. The burr grind technology guarantees a more even grind, resulting in uniform size grounds. This ensures that the water soaks into the grounds more effectively, bringing out the full flavor of the coffee. Additionally, with a burr grinder you are able to get finer grounds than with a blade grinder. This means your espresso will be rich and creamy every time. The ceramic construction of the burrs helps keep heat and static electricity to a minimum. Metal burrs can create static, causing the grounds to stick to the insides of the machine. This causes buildup and residue that requires detailed cleaning. The low temperature of ceramic grinders prevents the beans having a burned taste that metal burrs can create when overheated. All in all, the ceramic burr grinder is the best grinder option available. The mid capacity water reservoir of the Saeco HD 8753 is just the right size for the average person. Capable of holding 50 ounces, it offers enough water to brew many beverages conveniently. However, it is not so large as to let the water go stale or take up too much space. A 15 bar pressure pump ensures that your espresso is rich and creamy every single time. This is the same pressure as used in coffee shop models. With 5 grind options with Saeco Intelia One Touch you are guaranteed to find the right setting for you. Choose finer for richer, darker shots, or coarser for a lighter flavor. 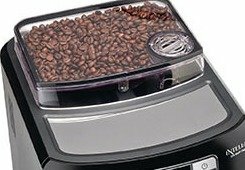 The 10 once bean hopper allows you to grind coffee for several beverages on a single fill. This offers about the same number of beverages as the water reservoir, which makes it even more convenient. Dishwasher safe components make cleanup quick and easy. Now it only takes a moment to remove the parts and place them in the dishwasher. Furthermore, you are assured a sterile clean every time. The push button interface makes program selection quick and easy. Choose the perfect beverage from an easy to follow menu with a simple press of a button. A 2 year limited manufacturer’s warranty guarantees the quality of the parts and assembly of the machine. The Saeco HD 8753/87 is constructed from sleek and durable stainless steel. This means the machine is as sturdy as it is attractive. Additionally, the stainless body only needs a quick wipe with a damp cloth to clean any spills or splashes. Cleaning and maintenance on the Saeco HD8753/87 is quick and hassle free. Cleanup is made simple by the fact that all removable parts are dishwasher safe. Now you never need to worry about having to hand wash all the nooks and crannies of the brew system. Additionally, the milk pitcher is dishwasher safe, meaning that you are ensured a sterile clean each and every time. Maintenance is made easy by the automated programs that help keep the machine in top performing condition. Automatic alerts will advise you when it’s time to perform a maintenance program. Choose the regular cleaning cycle to flush out any and all residue from the brewing system. Alternatively, choose the automated descaling program to remove any calcium or mineral buildup from within the machine. The push button interface allows you to perform any maintenance task by simply following the menu prompts and pushing the button to select the correct function. This makes it easy and hassle free to keep your Saeco brewing system good as new! The fact that the removable components of Saeco Intelia One Touch are dishwasher safe is a real plus. Many other systems have components that need to be hand washed. This not only takes more time and effort, but it can result in less than clean parts, depending on how serious a person is about getting the parts clean. Dishwasher safe components mean that you can be assured of sterile cleaning each and every time. Additionally, cleanup only takes the amount of time required to remove the parts and place them in the dishwasher. The quality of any coffee starts with the quality of the grind. A built in ceramic burr grinder ensures that you get top quality grinds every time. With a full range of brewing options, you can choose everything from brew temperature, brew strength and even brew volume. No matter what preferences you have, the Saeco HD8753/87 is guaranteed to be able to deliver on each and every one of them. The Saeco HD8753/87 is an ideal model for anyone who wants perfect espresso beverages without needing to be a barista. While doing the Saeco Intelia One Touch Review, we did thought that the functions being provided with this price point are marvelous in a super automatic espresso machine. A fully automated brew system means that perfect beverages are as simple as one touch of a button. In addition, the milk frothing system guarantees coffee shop quality foam for lattes or cappuccinos. The integrated nature of the milk frother makes frothing both easy and mess free. This unit is better suited to a single person or a small group, as it is a single brewing system.